In case you are catching the train running, here is the link to the introduction blog of the Machine Learning in a Box series which allow you to get the series from the start. At the end of this introduction blog you will find the links for each elements of the series. Last time, you got access to not one, not two, not three but four tutorial groups helping you to start building machine learning models using real data and algorithms. There should be no more secret on how you can use an AFL function to run one of the predictive algorithms available with SAP HANA. Let’s now look at this new post. Welcome to part 10 of Machine Learning in a Box! In part 7 of this blog series, I introduced a new tool called Jupyter Notebook, one of my favorite go-to tool when dealing with data science activities. Just as a refresher, Jupyter Notebook is an open-source web application that allows you to create and share documents that contain live code, equations, visualizations and narrative text. In a nutshell, a realm of endless possibilities at your fingertip. So, why would you look at JupyterLab, the reason is simple: JupyterLab is the next-generation web-based user interface for Project Jupyter. It doesn’t mean that your notebooks are useless, and you will need to code them again, not at all in fact. JupyterLab enables you to work with documents like you did with Jupyter Notebooks and use kernels etc. but that’s not it! It also allows you to use text editors, terminals, and custom components in a flexible, integrated, and extensible manner. For example, the Code Consoles provides you a transient scratchpads for running code interactively, with full support for rich output. JupyterLab also offers a unified model for viewing and handling data formats (images, CSV, JSON, Markdown, PDF, Vega, Vega-Lite, etc.) and can also display rich kernel output in these formats. 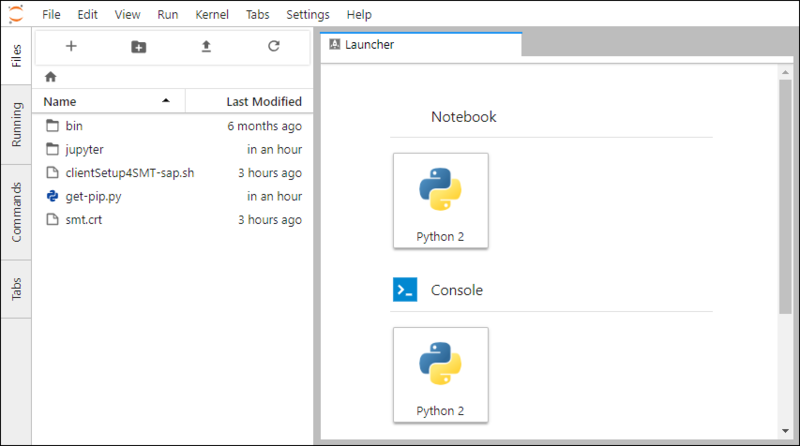 JupyterLab is served from the same server and uses the same notebook document format as the classic Jupyter Notebook. Again, just like with Jupyter Notebook, you can install JupyterLab both locally on your machine or on your SAP HANA, express edition server. The installation is pretty straight forward if you choose a local installation, you can refer to the online installation guide. Now, if you decide to setup JupyterLab on your SAP HANA, express edition, you will need to consider a few things which I have documented in a tutorial. For example, you will need to generate a configuration file and enable the use of the machine IP address instead of localhost, in addition to set up SSL (optional) and a password (optional). Feel free to use the “provide feedback” link in the tutorial to let me know what you think about it. I hope I did enough teasing for you to get tempted and start using JupyterLab from now on. Anyway, if you want to learn more about it you can check the JupyterLab announcement blog. On my side I will do my best to provide you with notebooks in the future with content I produce.